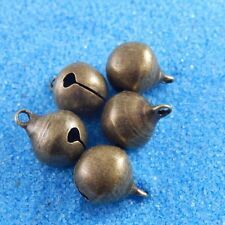 Copper bells,NO rust. Super loud, keep your animals be found easily. Material: Copper. Color: Bronze. We will do our best to help you to resolve your problems. We will try our best to reduce the risk of the custom duties. DO NOT DUPLICATE OR COPY! We really value your opinions of our products and services! Item Code : 35770. Desk Bell BOJ EIBAR BRASS TURTLE HOTEL DESK WIND-UP BELL EXCELLENT CONDITION . Condition is Used. Shipped with USPS Priority Mail. About 5" from tip of nose to tip of tail. FREE SHIPPING !!!!!!!! This beautiful antique bell features the added feature that the internal clanger is in fact the ladys two legs! The bell has a beautiful aged patina and I have no doubt this is a genuine early example likely late Victorian era c1890-1900? Beautiful and in lovely condition. The bell stands 9.5cm approx. Weight 200 Grams. 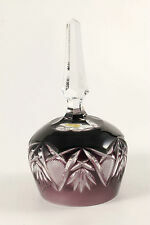 We have listed several other pieces including jewellery, silver, decorative art and collectables. Please refer to our other listings, we’re always pleased to combine postage costs to save you money. 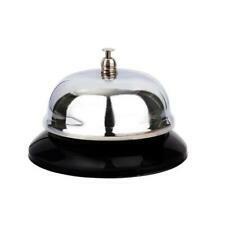 1 X Restaurant Service Bell. Ring the bell for prompt service. Also great for kids' pretend play. Due to light and screen difference, the item's color may be slightly different from the pictures. Acquired at an Estate that received Landmark Designation (1778). See Photo #12. This Estate was a Fort on The Harbor, During the Revolutionary War. Weighs 24 Lbs. Stands 19" Tall & 16" Across. I believe this piece is 40-50 years old. 1 x Grazing Bell. This bell is specially designed for cow,sheep or horse. Excellent for farm breeding. Quantity: 1 Pc(1 pc of bell only,other accessories demo in the picture are not included!). Resounding sound will make it effective and have great effect on preventing them from escaping or stolen. Bells are shiny and firmly attached. Good Luck! This kind of bell is for farm animals,which will make sounds when grazing. The loud is crisp, and can spread farther. Size: One Size. Quantity: 1 Pcs. Height: 6.5cm(2.56in). Great Size Bell with Clapper & Handle. Overall Good Condition. Small crack on bottom.See Photo #7. Nice heavy vtg cast iron wall mounted bell. Features a vtg model car. Some surface rust and paint wear. Bell is 13” tall 6.5” wide. Weighs 4.6oz. Amazing souvenir! Hand made product! Functional as well as attractive, this unique piece will be a perfect accent for a shelf or side table. This is a new item designed to look old. If You Part May Be Missing. Filling Of Hunting Seen Is Loose Condition And Details Are Showing In Images. Over 80 Years Old. Being Sold As Is. Heavy weight leather good buckle at end, I did not find any markings on this by manufacturer. 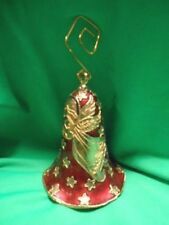 Nautical Solid Cast Brass Ships Bell Bronze Finish 5". This nautical marine solid brass Ship's Bell has a diameter of 5" and is brand new. The marine Ships Bell has a bronze finish and includes a chunky hand knotted lanyard. This heavy solid brass bell is handmade and was sand cast. This is a Loud bell which is sure to be heard throughout the neighborhood! Size: 5" diameter, Material: Solid Brass, Finish: Bronze, Construction: Handmade sand cast brass, Includes: Hand braided & knotted lanyard. Bell Pushes made by Peter Tereszczuk are among the best for any bell collector. They are real pieces of art. In this case the bell depicts a very young cabin boy, maneuvering with a rope (the bell wire). 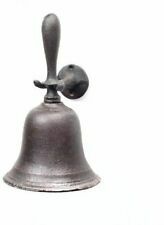 Nautical Antiqued Brass Finish Solid Brass Ships Bell 12". This nautical Antiqued Brass Finish Ship's Bell has a diameter of approx. 12" and an overall height of 18" (highest point of bracket to bottom lip of bell). The bell is handcrafted of solid cast brass and has an antiqued brass finish. This nautical ship's bell includes a hand knotted lanyard and a wall bracket. This is a loud sounding bell which is sure to be heard through out your neighborhood and is a nice addition to your nautical wall decor! Bell diameter size: approx. 12" (width of bottom lip of bell), Bell height: Overall 18" (highest point of bracket to bottom lip of bell), Material: Solid brass, Finish: Antiqued brass finish, Construction: Handmade, Includes: Hand braided lanyard & brass bracket. Nautical Solid Brass Ships Bell 11.5" with Anchor Wall Bracket. This nautical marine solid brass Ship's Bell has a diameter of 10" and is brand new. The marine ships bell includes a hand knotted lanyard and a solid brass anchor wall bracket. 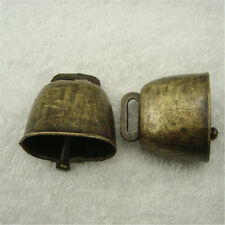 This heavy solid cast brass bell is handmade. This is a Loud bell which is sure to be heard for many miles! Bell size: 10" diameter x 11.5" height, Bracket size: 11" height x 9" width, Weight: approx 5.5 lbs, Material: Solid Brass, Construction: Handmade cast brass, Includes: Hand braided lanyard & wall mount, Made in India. Nice ring! It is 6 3/16" tall (bottom to handle); 4" across the widest part. Amazing souvenir! Hand made product! Made in Jerusalem. Classic and clean design, very good sound! Nautical Solid Aluminum Chrome Ship's Bell 7". This nautical solid aluminum Ship's Bell has a diameter of approx. 6.75" and is brand new. The chrome finished nautical ships bell includes a hand knotted lanyard and a wall mount bracket. This solid cast aluminum bell is handmade. This is a medium loud bell which is sure to be heard through out your house! Bell size: approx. 6.75" diameter x 7" height, Weight: approx. 1.95 lbs, Material: Solid aluminum, Finish: Chrome finish, Construction: Handmade, Includes: Hand braided lanyard and wall mount bracket, Free shipping only within the continental 48 U.S. States, Made in India. VERY WELL MADE. HAWAII ALASKA PUERTO RICO & US TERRITORIES NOTWITHSTANDING . Sterling Silver Table Bell by Stuart Devlin - Vintage Elizabeth II (1981). STEEL COW BELL Antique Style Copper Finish Cowbell Music Sports Pep Rally Cheer! We NEED More Cowbell! Hit it with a drumstick or shake it really loud! This cowbell is perfect for making a ruckus! Use it to make music! The possibilities are endless! Zinc clapper with loop and eye constructed in a single piece. In Southeast Asia, the temple elephant bell is one of the most interesting we have encountered to date. Bronze look, excellent shape. Approx 4 1/4" tall, by 5" long, by 2" wide. •. 9 lbs Solid Bronze approx (no resin). • Excellent Quality grade A bronze. Gorgeous iron, copper, leather table gong. It was used to alert the lunch or dinner. This bell is in excellent condition. Antique ca. 1910-1930 Pair of Brass Bells. The smaller bell with the ebony handle is older, probably actually Victorian, but I'll say 1910 at the end of that age to be safe. The other bell has a walnut handle and is 1920's, latest 1930. This nautical marine solid aluminum Ship's Bell has a diameter of approx. 8.5" and is brand new. The marine ships bell includes a hand knotted lanyard. 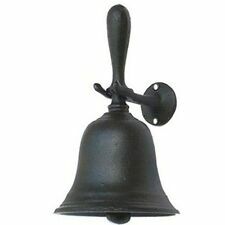 This heavy solid cast aluminum bell is handmade. This is a medium loud bell which is sure to be heard through out the neighborhood! Bell size: approx. 8.5" diameter x 8.5" height, Weight: approx 3.7 lbs, Material: Solid aluminum, Construction: Handmade, Includes: Hand braided lanyard, Made in India, Free shipping only within the continental 48 U.S. States. Nice Aged Bell with Good Sound. The Bell Opening Is 4.5" x 3.25". Item Shows Wear Consistent With Age.